Impact Wrestling this week had a lot of good in ring action, as the Bound For Glory Series began and Open Fight Night returned, meaning we were guaranteed six one-on-one contests between some of TNA’s best. However, some of the non-wrestling segments on the show were disappointing include a big reveal at the end of the show, that really wasn't as surprising as Mike Tenay made out. The story running throughout Impact Wrestling this week was the idea of Sting attempting to build a New Main Event Mafia. With a number of segment’s following Sting around the backstage area with Sting talking to the camera about his plans. We also saw Sting shaking a mysterious hand, who had apparently agreed to join the Main Event Mafia. In terms of building anticipation for the big reveal later in the show these segments worked well, even if they only went over ground already covered by Sting last week. The plot thickened as the show went on, with Bully Ray and the Hogans both getting involved as we headed towards the reveal. Firstly, with Hulk Hogan talking on the phone backstage, Bully attempted to sneak up on him with the hammer, only for Hogan to catch him shoving him into the wall. I’ve said it before I absolutely hate the hammer thing, especially with both Hogan and Bully sneaking up on each other in recent weeks. Are they planning to kill each other? In my opinion, this should have no place in wrestling. Bully Ray said he was looking for a Brooke, and Hulk told him it was over between them. If Hulk is attempting to use this storyline to show off his acting ability, it isn’t working, as Bully Ray out does him in almost every aspect, during this bizarre love triangle. Reluctantly, Brooke agreed to leave the arena after Hulk said he didn’t want any more drama on the show. There was a nice segment with Bully Ray talking to Brooke on the phone in an attempt to get her to return. Bully has certainly worked hard on this side of his game over the last two years, and it was a really well played moment by the TNA World Heavyweight Champion. Although, I’d rather see Brooke out of current storylines, especially involving the World Heavyweight Championship, I guess it allows Bully to have a story going, whilst the Bound For Glory Series continues. Bully sent Aces and Eights to pick up Brooke and headed out to the ring. At the same time though, The Icon was heading out into the arena and told TNA cameras that he had some family business to attend to. It was pretty good set up, even if we could see what was about to happen from a mile off. Bully made use of Open Fight Night to call out his wife, reminding the crowd that he was a lover not a fighter in another top notch heel promo, however Brooke didn’t show up. Of course, it was Sting who appeared on the entrance ramp, with the Main Event Mafia theme blaring. Sting stayed quiet allowing Bully to run his mouth some more about his victory over Sting at Slammiversary. Sting began to strip down his suit, awkwardly having trouble undoing his tie. Bully attempted to call out Aces and Eights for back up, but they had been taken out backstage. I struggle to see how Aces and Eights are meant to be seen as a threat to anyone when they are always being taken out and none of the members of the group, bar Bully Ray and Mr. Anderson, and possibly Devon, have looked strong at any point of their TNA tenure. Sting threw the first punch and Bully attempted to run to the back, only to be blocked by the first new member of the Main Event Mafia…. Kurt Angle. It wasn’t much of a surprise as Angle, along with Samoa Joe, were the two guys that seemed nailed on to join the group. It would have been fine in the middle of the show, but to finish on this big reveal was a kind of weak way to finish the show. The show kicked off with all the Bound For Glory Series qualifiers in the ring, with Hulk Hogan on the entrance ramp talking up the BFG Series. 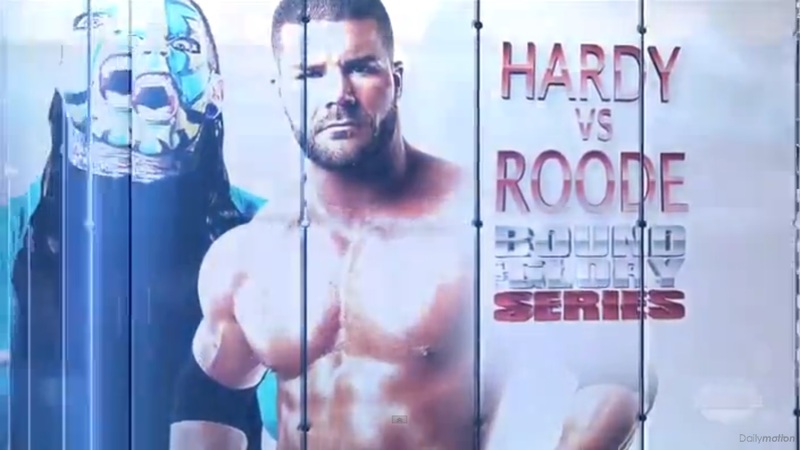 Bizarrely, he then introduced two more qualifiers, despite having already announced this on the previous Impact Wrestling, Jeff Hardy and Bobby Roode would receive automatic places because of winning the previous two series. This isn’t the first time something like this has happened with a similar occurrence of Hulk seemingly forgetting what had happened a mere week ago. Hogan then revealed the result of the Impact Fan Vote, which saw Jeff Hardy get the first Open Fight Night call out, over Bobby Roode. It was an obvious decision and similar to when WWE runs the App votes on Raw, felt a little bit like insulting the intelligence of the fanbase into thinking they actually have some form of control on the show. A number of Impact wrestlers went on to state their case of why Hardy should or shouldn’t pick them for the first call out. Austin Aries went first with an entertaining promo, putting himself over as as popular as Jeff Hardy and attempting to get the crowd to chant his name, it worked for part of the crowd but nothing like what we’ve heard for Aries in the past. Christopher Daniels told Jeff he better not choose either member of Bad Influence because he’d go home with no points. Daniels is always a pleasure to listen to on the microphone for me, coupled with the ability to have fantastic matches week in week out, Daniels should be great to watch throughout the tournament. However, Hardy eventually went for the obvious option of Bobby Roode and we had ourselves a classic multi-man brawl between all the participants to end the first segment. As we’ve seen with Roode and Hardy in the past on a number of PPV’s and Impact’s these two are capable of putting on some very good match together. Even though the contest was fairly short for a Main Event (it went a little over six minutes of television time) it was another solid outing for two of TNA’s biggest names. Roode spent most of the match methodically taking apart Hardy, with The Charismatic Enigma’s offense coming mainly in the form of quick short bursts. There was a number of near falls throughout and it looked like Roode might have it won after Hardy missed a Swanton Bomb, and ended up in a Crippler Crossface. This lead to the finish of the contest with Hardy turning the Crossface into a pin for a two count, with Roode attempting to take the lead, Jeff hit a Twist of Fate out of nowhere for the victory. It was decent contest between the two, although it doesn’t really rank with the previous battles they’ve had mainly due to time constraints. I’d expect both to be near the top of the series as it progresses, although I wouldn’t expect either to pick up another win in the tournament. I’m interested to see what TNA has planned for these two over the next couple of months as they will surely both command major storylines heading into Bound For Glory, that have yet to show themselves as of yet. We also got another huge match up for the Series, pitting long time rivals Samoa Joe and AJ Styles against each other. Anyone whose followed TNA since it’s inception in 2002, will know of the long and storied rivalry between these two TNA stalwarts. 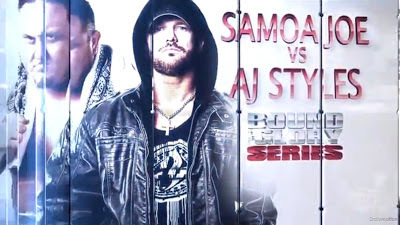 Before the contest, AJ cut a very good promo, portraying the new darker element of his character well, saying he wanted the TNA World Heavyweight Championship for the money and that he was doing his own. I’m really enjoying this new side for Styles to portray at the moment, it seems fresh and it’s interesting to see how it will develop throughout the Series leading into Bound For Glory, Styles’ seems to be relishing the opportunity as well. The thing I liked about this match was how different it was to the previous battles these two have had. Styles has been working a different in ring styles as of late, which has been a lot more calculated than we had been used and therefore this match with Joe was worked at a slower pace but knew when to up the tempo when needed, the first time we saw this was in a nice exchange than ended with Joe taking Styles’ legs out from under him, sending AJ crashing into the apron. The match was fought extremely stiff throughout and managed to make every single punch and kick seem important to the match. There was some nice chain wrestling towards the end of the contest with Styles and Joe both placing each other in signature submission holds before AJ tried to sneak a pin. It was a shame that Christy Hemme announced there was only five minutes left of the time limit, as it gave away the finish of the contest pretty early on. It would have been a lot better if the seeds of this had been planted in an earlier match with someone picking up a win with five minutes left. The two did go to the time limit, and continued to fight after the match was over. They both received two points in the Series and AJ Styles is still my favourite to win the whole thing. There was also a State of the Knockout’s Division speech given by Brooke Hogan, with the entire knockouts roster (now looking fairly thin) in the ring. Mickie James gave her piece, continuing to grow into the heel role, as she cut a self-centered promo putting over her achievements in the last few weeks. Eric Young and ODB were stripped of the Knockout’s Tag Team Championship after a year and a half reign. Personally, I hope the championships are forgotten as there isn’t enough Knockouts around to support the belts properly, as has been the case for the majority of their tenure. Despite Mickie James’ attempts to stop the match, Brooke announced Mickie James will defend her title against Velvet Sky next week on Impact, which looks set to be the blow off match for the rivalry. Also announced for the June 29th Impact from Las Vegas, was a Ladder Match pitting Gail Kim against Tarynn Terrell with a Number One Contenders Spot on the line, if the match they had at Slammiversary is anything to go by this will be a brutal contest. This segment worked in setting up a number of matches at the same time, as well as resolving the Tag Title issue, however I still find Brooke Hogan incredibly annoying and she continues to look awkward when discussing wrestling matters. Kazarian used Open Fight Night to call out Magnus, because of Magnus being called the future of TNA. This was another case of match that would have benefitted from more time, which was somewhat of a theme throughout the show. Magnus dominated Kaz for most of the contest, which was fought at a fairly quick pace due to it only going about two and a half minutes. The ending was also well worked with Magnus catching Kazarian’s drop kick attempt and applying the Texas Clover Leaf for the submission victory and ten points in the Series. Magnus was top of the leader board by the end of the night, it will be interesting to see if he keeps it up, as a good run near the top of the Bound For Glory Series would certainly elevate Magnus. Kazarian’s Bad Influence partner Christopher Daniels was also in Bound For Glory Series action after being called out by Hernandez. Prior to the call-out Hernandez was seen backstage getting advice from friend Chavo Guerrero, Jr., I’ve got a feeling we might see Chavo turn on Hernandez leading to contest between the two at Bound For Glory. This was another short match, between another two talented members of the TNA Roster. Daniels dominated the early going, until Hernandez’ power shone through to give him the upperhand, including the now signature charge down the entrance ramp. However, Daniels veteran craftiness got him the victory, as he managed to manoeuvre Earl Hebner into the correct position to allow for a Low Blow to go unnoticed before hitting a BME for the seven points. It was nice, if unoriginal finish, that worked well for the character Daniels portrays at the moment. I can’t see either men winning the series at the moment, although hopefully they’ll get a bit more time as the tournament goes on to show what they can do. Mr. Anderson chose to call out Joseph Park for his Open Fight Night challenge, believing it was guaranteed win. It wasn’t a particularly memorable contest, with Anderson not taking Park seriously and Park showing him up on a number of occasions. In the end, it took a kick from DOC to allow Anderson to hit the Mic Check for the victory and seven points. With a lot of matches needing extra time on the show, this wasn’t one of them and could have actually been helped by having less time. The tension between DOC and Anderson was played up in a backstage segment later on in the night, with both claiming they should be VP for Aces and Eights, with DOC claiming Anderson wouldn’t have won without him. It comes to something when the biggest stable in TNA, can’t beat Joseph Park cleanly. Former Gutcheck contestant Jay Bradley used his Open Fight Night opportunity to call out Austin Aries. Bradley looked good in pre-match promo, he seems to play the role well, with some charisma and it will be interesting to watch him as the Series progresses. The match was also a strong contest, definitely Bradley’s best match since joining the TNA Roster. With an interesting heel vs. heel dynamic that isn’t often seen in pro wrestling, (although the crowd was firmly behind Austin Aries) both men went back and forth in terms of momentum. Bradley seems to possess a fair amount of technical prowess whilst also been able to take advantage of his size with a number of power moves including an impressive high lift spinning backbreaker. The match also built up Bradley’s Boomstick finishing move well with Aries narrowly ducking the lariat on a number of occasion. Aries’ picked up the win with an awkward looking Brainbuster for the Seven points. I think it’s important for the Gutcheck concept, that Bradley picks up some impressive victories in this series, as if he becomes, as I expect he will be, the whipping boy of the tournament it won’t look very good for any potential Gutcheck winners in the future. Hulk Hogan also spoke to X Division Champion Chris Sabin, as well as Kenny King and Suicide, as it was revealed that Destination X will be returning as a special edition of Impact Wrestling on July 18th, where the X Division Champion will have the opportunity to trade in his title for a shot at World Heavyweight Champion Bully Ray. I’m glad TNA hadn’t completely dropped the concept, as it seemed like a good way of building the X Division Championship back up after it had been poorly used, in a few years time I’d love to see a Champion refuse to cash in, thus building the belt even higher. Sabin, King and Suicide will face each other next week in a three way for the title, which will also decide who get’s the title shot at Impact: Destination X. The logical move would be Sabin, as he has only just won the title and it would continue his comeback storyline, however TNA doesn’t always go for the logical and it could be argued that Sabin isn’t a big enough name to realistically challenge for the World Title at current and possibility wouldn’t draw the big rating TNA will be hoping for from the Destination X show. 1. Mike Tenay was a lot more shocked to see Kurt Angle join The Main Event Mafia than the majority of the audience. 2. The Bound For Glory Series will present us with some great matches on paper, but time constraints will hurt the matches. 3. TNA also has an App. Who knew?